I couldn't help myself. I had a tree full of oranges and a bag of chocolate chips. 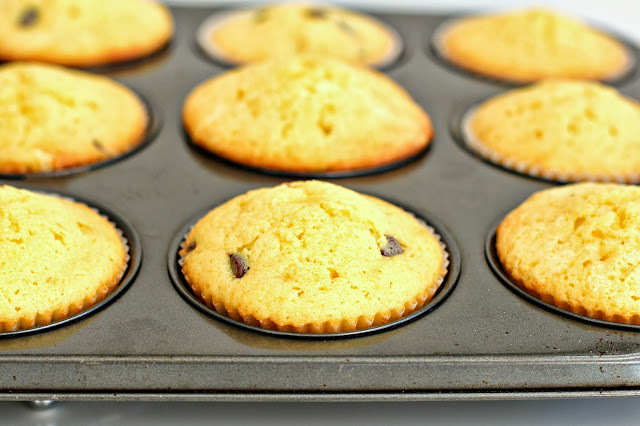 Preheat the oven to 180 degrees C. Line a 12-hole muffin pan with paper liners. Set aside. In a separate bowl sift together the flour, baking powder, bicarbonate of soda and salt. Set aside. In the bowl of an electric mixer fitted with the paddle attachment, beat the butter and sugar until light and creamy. With the mixer speed on medium, add the orange zest, then the eggs one at a time, beating well after each addition until fully incorporated. In another bowl, mix the cream, orange juice and vanilla. Whisk to combine. 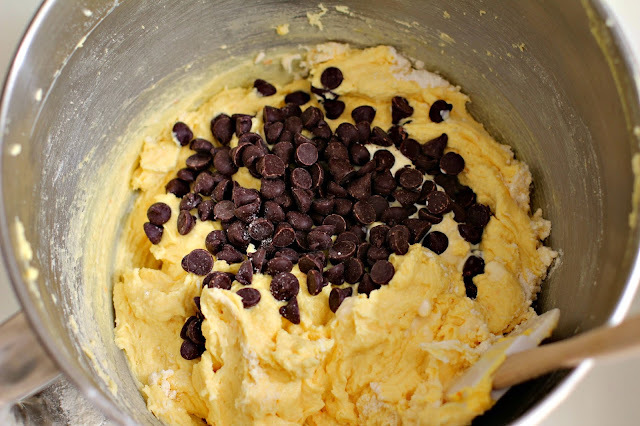 With the mixer on low speed, add 1/3 dry ingredients to the butter-cream mixer, then add 1/2 of the cream mixture. Mix until incorporated. Add another 1/3 of the dry ingredients, the last 1/2 of the cream mixture and mix until incorporated again. Finally, add the last 1/3 of the dry ingredients. Mix until just incorporated. Add the chocolate chip and stir them through with a spatula to distribute them evenly through the batter. 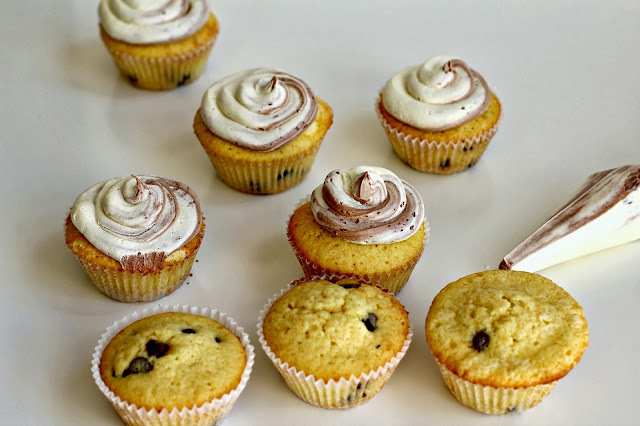 Using an ice cream scoop, scoop the batter evenly into the paper liners and bake for about 20 minutes, or until a skewer inserted into the centre of a cupcake comes out clean. Remove them from the pan and leave to cool completely on a wire rack. In the bowl of an electric mixer fitted with the paddle attachment, beat the butter until it is creamy. Add the icing sugar and salt and beat until incorporated. Add the cream, vanilla, orange juice and beat on medium speed until it is pale and fluffy, about 3 minutes. Remove half of the frosting to a separate bowl. 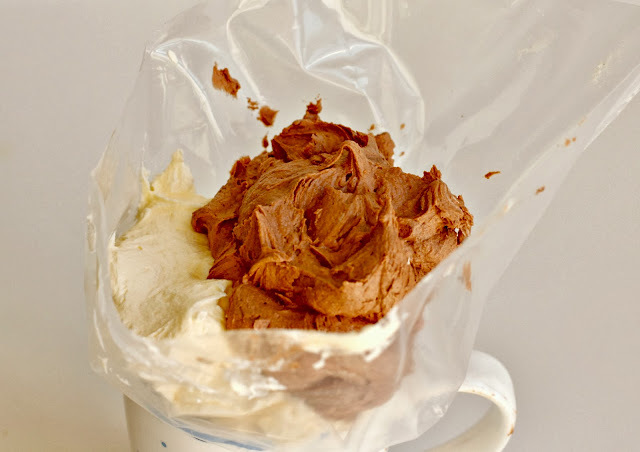 Add the 3 tablespoons cocoa to the remaining half of frosting and beat to combine. 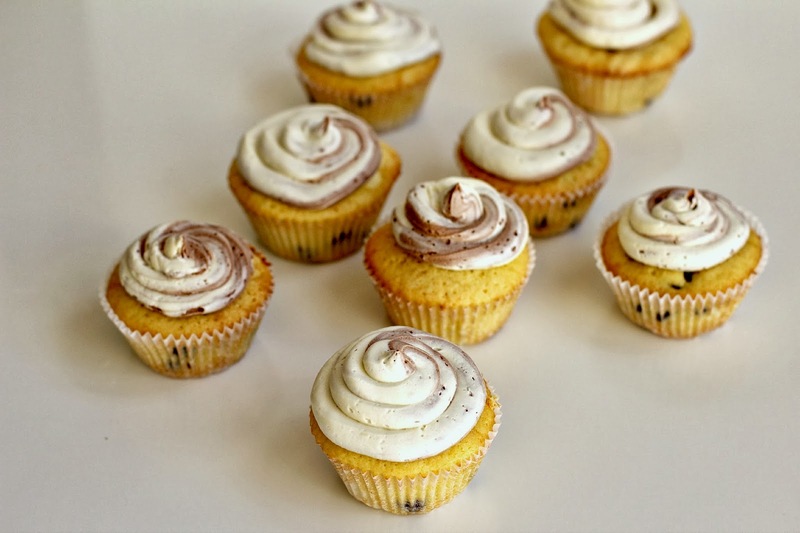 Using a disposable piping bag, gently spoon the vanilla frosting down one side and then spoon the chocolate frosting down the other side. Snip a 1cm hole in the end. Pipe swirls of frosting on top of the cooled cupcakes. These little cakes look very cute Jen. I took a bunch of your oranges from work yesterday and they are nice and sweet. Thanks! Thanks Sam. I have about 10 times as many still left on the tree. Help! You have an orange tree!! Pics please (oh and lucky duck). This looks divine. Love the flavor combination. Just in time for weekend baking. Hi Eva. Thanks for your lovely comment. Don't you just love a bit of weekend baking? Happy days. Thanks Gabrielle. We are very lucky here. We can grow just about everything. My garden is a riot of coloured blossoms at the moment. I love the swirl frosting Jen. I bet these were tasty. Notice I used the past tense as they must have been devoured quickly. Have a sweet weekend yourself! You know me so well Patty and thank you. LOVE the combo of chocolate and orange...enough said! These looks beyond delicious! Me too Jessica. Orange and chocolate anything! Send a dozen my direction, pretty please? 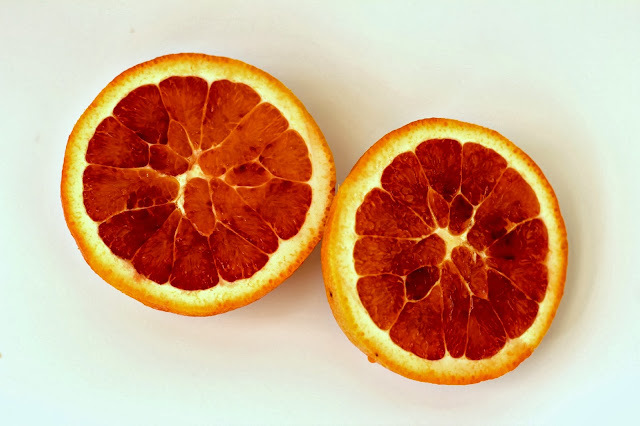 Orange and chocolate go great together! 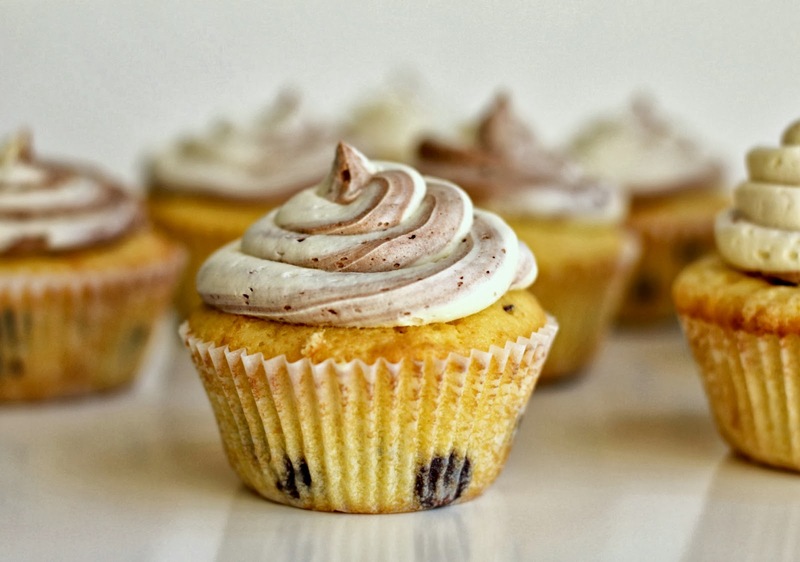 What a perfect flavor combo for cupcakes! 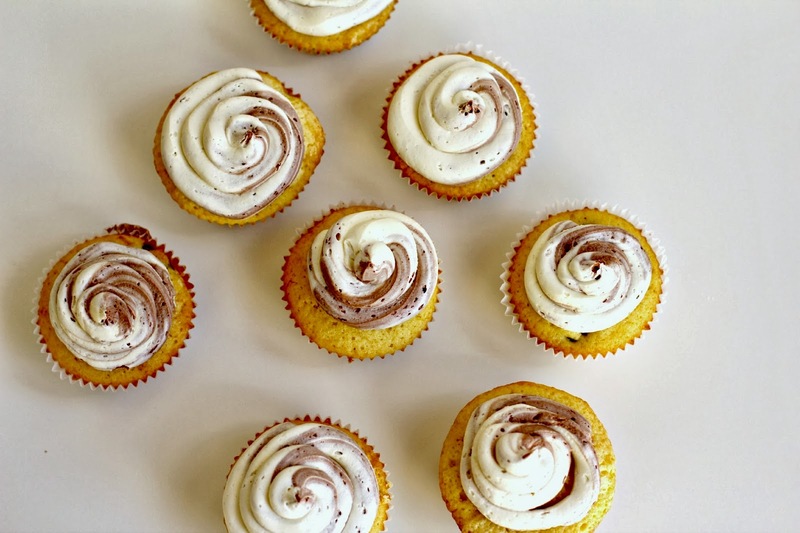 Orange and chocolate were just meant to be together in a cupcake don't you think? I'm so jelly of all your gorgeous fruit trees. I can think of no better way to use them! Thanks Maria. I'm so lucky to have my fruit orchard, veg garden and chickens. I try to make good use of all of them.